Late afternoon light on the Guadalupe Mountains, west Texas. Obstacles crop up as often in photography as they do life in general. It’s tempting to think only in terms of technical problems (exposure, focus, etc. ), and it’s true that techniques of photography can take up a lot of your thought and effort. But I’m not covering these sorts of obstacles for a simple reason. Shooting a lot (see Part I) will allow you to handle those things easily enough. This series of posts is about the bigger obstacles, those that stand in the way of becoming a very good (or even great) photographer. As Joe McNally, the famed National Geographic photographer said, “If you want to be a better photographer, stand in front of more interesting stuff”. With photography, putting yourself in front of interesting subjects is the pathway to success. Of course what one person finds interesting others may not. But it is true that some subjects photograph much better than others do. For example, put a human in any picture and you automatically connect with people (funny how that works). Do me a favor though, resist the urge to picture someone with tripod and camera in front of a sunset ;-). Enjoying the last flat section of the Cooper Spur route, north side of Mt. Hood, Oregon. Here’s one simple example of how to include interesting stuff in your photos. If you’re going on safari (anywhere not just Africa), why not try to time it for just after most of the animals bear their young? Nothing is cuter than a baby animal of course. But more importantly, the presence of youngsters means a better chance to photograph interesting behavior. While the above considerations factor into making good images, ultimately it’s really about your relationship with the subject. In order to get great pictures, it’s best to be into your subjects, to like (or better, love) them. If you like them enough you’ll spend more time with them and learn lots of interesting stuff about them. As a result, your photos will come out better. It’s true that what will make you an accomplished photographer is an ability to shoot anything well. After all, why not be up for shooting any subject? Approach it with respect and an open mind. But don’t get in the habit of settling for easy-access subjects when you really want to shoot something else. By the way, don’t think your desired subject has to be in a distant exotic locale. It just has to be what you’re fascinated by. And you’ll overcome any obstacle to access and photograph it. As an example, a subject like the high forested Oregon side of the Columbia River Gorge, shown below, for a time became a personal quest to shoot in just the right light and weather conditions. This particular image is of Mystery Ridge, one of the toughest off-trail scrambles in the Gorge. After hiking it (can you call that hiking? ), I wanted badly to photograph it in classic mist-shrouded conditions. 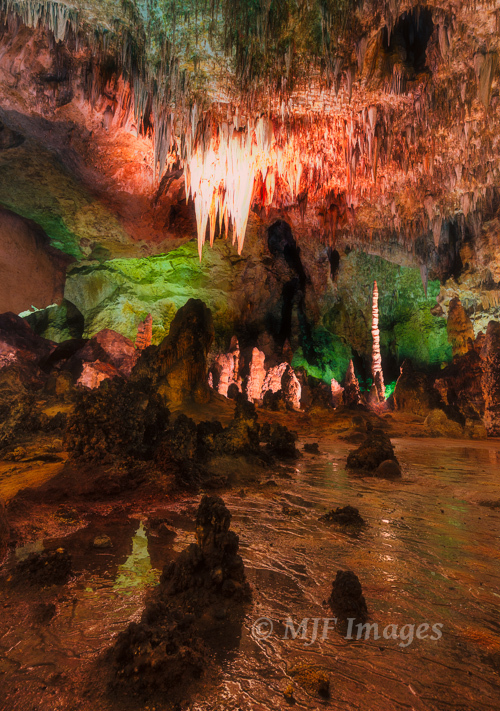 Here’s another example: I had always wanted to visit and photograph Carlsbad Caverns. But its out of the way location had been putting me off. Recently, after coming across some smaller caves in Arkansas, my urge to go was stoked again. So I made the drive to New Mexico and was so glad I did. The great thing about going somewhere out of the way is that you so often discover other places you never realized existed. It makes the trip that much more worthwhile. Just south of Carlsbad lies the Guadalupe Mountains (image at top). What a nice bonus they were! It’s a fantasy-land below ground. No sunset this time, don’t want to be too predictable! Thanks so much for reading. Stay tuned for more of this series next Friday. Have a wonderful weekend. Great quote! And what better way to put that into practice than standing in front of a young zebra? Thanks Lyle, it was you that reminded me of his quote! My friend, I have a question. Have you any images (as bad as this sounds) of nature at its most gruesome? I’m putting together a book cover and searching for the right image. Well well well, I’ll have to look. I don’t generally photograph that sort of thing even when I see it. Guess I’m just too fascinated to even think of shooting in those rare times. And they are rare! Off the top of my head I have a few of a hippo carcass being scavenged by vultures plus a lion in Zambia. The smell was more gruesome than the scene! I can appreciate you not focusing on such images. I wouldn’t either. The book, though, is a sort of expose of the nastiness. If you do have something let me know, OK. Thanks! Okay John, shoot me an email just so I have your address. Just hit the “contact” link up there at upper left under the blue search box. Sounds like an interesting book!